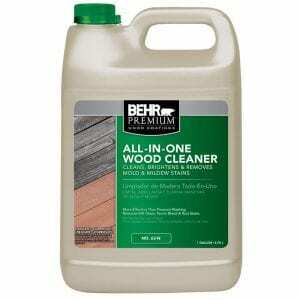 – BEHR Premium 2-In-1 Deck Cleaner is not a stain stripper. – The BEHR Premium 2-In-1 Deck Cleaner applies easily with a pump sprayer. No mixing needed. Just fill sprayer and apply. Consistency hasn’t any issues with clogging of the sprayer. – We were not impressed with the overall cleaning. The Condition of Deck: Heavily grayed with mold/mildew. How Much Product Used: 4 Gallons Retails for $15.99 per gallon. I applied but with a britle broom, scrubbed it in and waited. I had cleaned the front porch with half and half bleach first and it still needed more. Once this was applied waited 15 min and hosed the deck down with water. Very pleased. Just a little elbow grease and it is good to go. If that is what they say to do it is correct. LOVE this stuff! Been using it for years on my deck, vinyl siding, and cement benches. Works like a charm. Too bad my Home Depot doesn't seem to carry it anymore.